A medical student from Plymouth University Peninsula Schools of Medicine and Dentistry (PUPSMD) has received an award of £1,000 from the Peninsula Medical Foundation, the independent charitable arm of PUPSMD, to pursue a research project comparing treatment and results for spinal surgery from the NHS and independent care providers, as part of the INSPIRE scheme. The INSPIRE scheme is led by the Academy of Medical Sciences and is funded by the Wellcome Trust. It aims to encourage medical and dental undergraduates to pursue scientific research. Ali Bakhsh has just completed his fourth year studying medicine at Plymouth University. 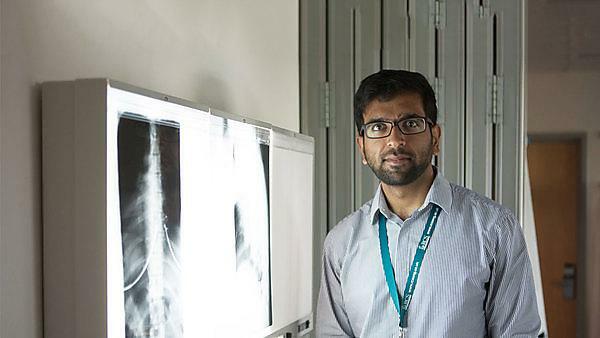 He will be working with Consultant Orthopaedic Spinal Surgeon from Plymouth Hospitals NHS Trust, Himanshu Sharma, using his patient data to make the comparison. The study will investigate treatment and results for approximately 200 patients. It will ask the questions – do patients receive the same treatment in the NHS and private care settings; and do they receive similar results? The work comes against a background of pressure to meet the 18-week target from consultation to surgery and changes to the availability of spinal surgery in the South West. Early and effective treatment for spinal pain is essential if patients are to avoid suffering from chronic pain. Untreated chronic pain leads to quality of life issues and affects an individual’s productivity – only one to two per cent of those who are off work with chronic spinal/neural pain for two years return to work, whereas the number jumps to 80 per cent for those off for three to six months. The study will look at a number of elements. The first is clinical effectiveness – are the right things being done at the right time by the right people? As an example, in the independent care sector services are 100 per cent consultant-led, which is not always the case in the NHS. Does this make a difference to incidences of clinical risks and complications? The second element will investigate levels of suffering and how pain affects function. The study will compare patients who were treated early with those whose treatment came later using patient reported outcome measures with regard to subjective pain and functional scores. This will be the first time that this investigation has taken place in spinal patients. It is hoped that the results of the study will be useful in addressing a number of issues affecting spinal surgery, including capacity for treatment, cancellation rates, control on patient booking and patients who ‘do not attend’.